A team of researchers has for the first time recovered a magnetic field record from ancient minerals for Iron Age southern Africa (between 1000 and 1500 AD). The data, combined with the current weakening of Earth’s magnetic field, suggest that the region of Earth’s core beneath southern Africa may play a special role in reversals of the planet’s magnetic poles. The team was led by geophysicist John Tarduno from the University of Rochester and included researchers from Witwatersrand University and Kwa-Zulu Natal University of South Africa. Reversals of the North and South Poles have occurred irregularly throughout history, with the last one taking place about 800,000 years ago. Once a reversal starts, it can take as long as 15,000 years to complete. The new data suggests the core region beneath southern Africa may be the birthplace of some of the more recent and future pole reversals. “It has long been thought reversals start at random locations, but our study suggests this may not be the case,” said Tarduno, a leading expert on Earth’s magnetic field. The results have been published in the latest issue of the journal Nature Communications. Tarduno collected the data for his study from five sites along South Africa’s borders with Zimbabwe and Botswana, near the Limpopo River. That part of Africa belongs to a region called the South Atlantic Anomaly—extending west beyond South America—that today has an unusually weak magnetic field strength. 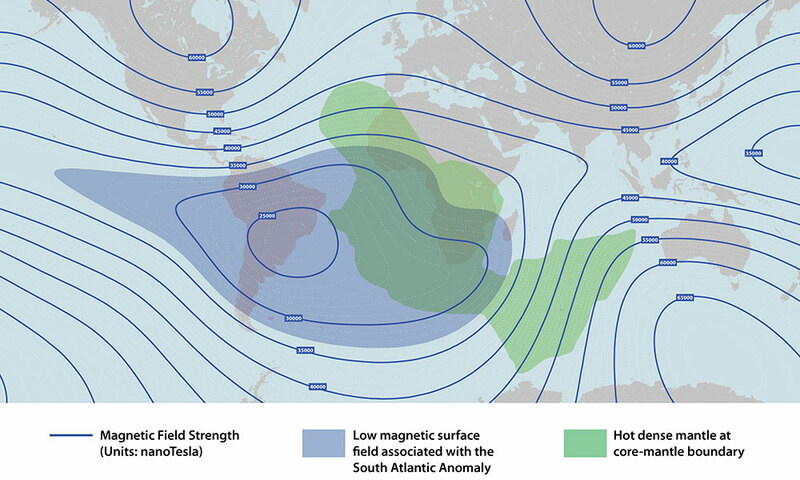 Earth’s dipole magnetic field strength has decreased 16 percent since 1840—with most of the decay related to the weakening field in the South Atlantic Anomaly—leading to much speculation that the planet is in the early stages of a field reversal. As Tarduno points out, it is only speculation because weakening magnetic fields can recover without leading to a reversal of the poles. Tarduno and his fellow-researchers believe they found the reason for the unusually low magnetic field strength in that region of the Southern Hemisphere. “The top of the core beneath this region is overlain by unusually hot and dense mantle rock,” said Tarduno. That hot and dense mantle rock lies 3000 km below the surface, has steep sides, and is about 6000 km across, which is roughly the distance from New York to Paris. Together with Eric Blackman, an astrophysicist at the University of Rochester, and Michael Watkeys, a geologist at the University of KwaZulu-Natal in South Africa, Tarduno hypothesizes that the region—which is referred to as a Large Low Shear Velocity Province (LLSVP)—affects the direction of the churning liquid iron that generates Earth’s magnetic field. Tarduno says it’s the shift in the flow of liquid iron that causes irregularities in the magnetic field, ultimately resulting in a loss of magnetic intensity, giving the region its characteristically low magnetic field strength. Until now, researchers have relied solely on estimates from models derived from data collected at other global sites for an Iron Age record of the magnetic field of southern Africa. Tarduno and his team wanted hard data on both the intensity and direction of the magnetic field, which are recorded and stored in minerals, such as magnetite, at the time they were formed. 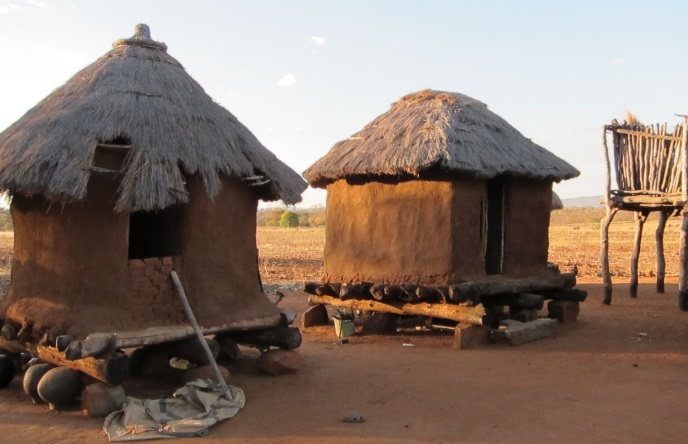 The researchers were able to get their data thanks to a knowledge of ancient African practices—in this case, the ritualistic cleansing of villages in agricultural communities. Archeologist Thomas Huffman of Witwatersrand University, a member of the research team and a leading authority on Iron Age southern Africa, explains that villages were cleansed by burning down huts and grain bins. The burning clay floors reached a temperature in excess of 1000 °C, hot enough to erase the magnetic information stored in the magnetite and create a new record of the magnetic field strength and direction at the time of the burning. Tarduno and his team found a sharp 30 percent drop in magnetic field intensity from 1225 to 1550 AD. Given that the field intensity in the region is also declining today—though less rapidly, as measured by satellites—the research team believes that the process causing the weakening field may be a recurring feature of the magnetic field. Tarduno points out that the new data cannot be used to predict with confidence that the present-day magnetic field is entering a reversal. However, it does suggest that the present-day pattern may be the latest manifestation of a repeating feature that occasionally leads to a global field reversal.